I don’t know about you, but for my husband and me, the holidays often involve movie marathons. This year, over the Christmas and New Year holidays, we decided to fully commit to the concept and watch all the Hobbit and Lord of the Rings movies. Yes, all of them. The extended editions. I know. That’s a lot of hours but I don’t regret it one bit. There’s something immensely moving about beautiful cinematography and epic quests. Martin Freeman’s interpretation of Bilbo will never not delight me. (That man should’ve won all the awards!) But one character always captures me most: Samwise Gamgee. A few years ago, I wrote about the scene in which he nearly drowns. (You can read that here.) I can watch a million, touching death scenes and feel next to nothing, but that scene practically gets me blubbering into my coffee. This time, though, there was another scene that caught my attention. In The Two Towers, as Sam and Frodo are edging closer to Mordor and the ring is slowly sucking the life out of Frodo, the two hobbits talk about the great adventure stories they heard growing up. I love that scene. Why do I love that scene? For one thing, it’s one of the only times Frodo explicitly acknowledges what Sam has done, the contribution he’s made to their mission. Most of the time, Frodo is too busy nearing the end of his sanity to recognize it. Or being mislead by Gollum. (Newsflash: when your best friend tells you someone is up to no good, BELIEVE THEM. Ahem.) So to see him acknowledge Sam is heartwarming. But mostly I love it because of what it says about Sam. 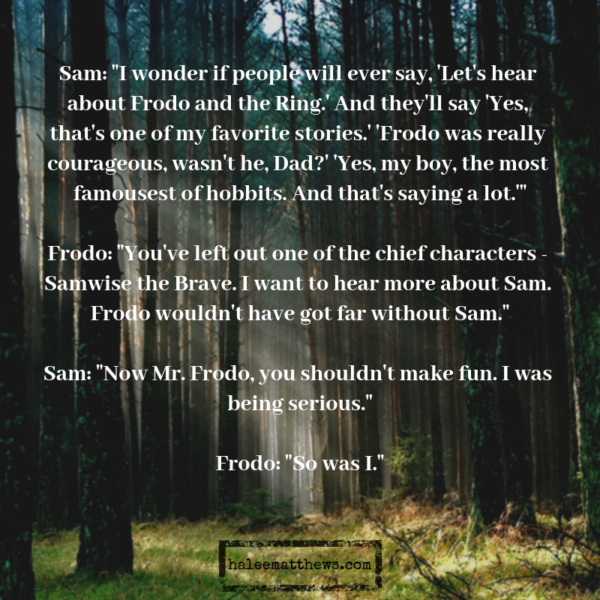 Specifically, he thinks Frodo is joking when the ring-bearing hobbit talks about Sam as an important part of the story. Doesn’t that say so much about what Sam thinks of himself? He doesn’t see himself as important, as vital to the story. All he knows is that he made a promise and he’s going to keep it. And he’s not wrong: in contrast to the others, Sam’s actually quite average. He’s no human king with elf gentility who’s running from his destiny. He’s no elf prince with grace and extraordinary skill with a bow. He’s no dwarf warrior who runs into danger like a battering ram. Compared to his companions, Sam is just an average hobbit. Except when it comes to loyalty. Unlike his stature, his loyalty is giant and his commitment unmatched. And while the others understand why the ring must be destroyed, I think Sam sees it through a different filter: home. He knows that great evil is never satisfied, devouring everything it can reach, even his beloved Shire. And it’s that love of home and loyalty to Frodo that keep his hobbit feet moving toward great evil, going into battle with not much more than a frying pan (and wielding it with the skill of a Southern woman, I might add). It’s not surprising that a writer (J.R.R. Tolkien) would write about the power of story. This scene is especially poignant in that regard because Sam is thinking about future generations who may hear their story and be inspired by it, as he and Frodo were by the stories of others before them. He starts out with a narrow view of what needs to be done: accompany Frodo. And over time, his view grows into a broad concept of how their mission may be remembered. On every step of their adventure, Samwise follows Frodo right into the darkness. And when Frodo’s strength fails him, just steps away from the fires of Mt. Doom, Sam doesn’t wax poetic about the nature of evil. He doesn’t tell him the world will end if he doesn’t summon his strength. No, he reminds Frodo of home—of the strawberries with cream and the green meadows. He reminds Frodo of those things worth protecting by reminding him of what hobbits love and appreciate. I have to admit, when it comes to the kingdoms of Middle Earth, I relate more to the elves, with their love of ancient wisdom, gorgeous waterfalls, and affinity for vegetables. But my husband is pure hobbit. There’s nothing he loves more than good food and a comfortable home. Maybe that’s why I adore Samwise so much. Because I see much of my human in him. Like Sam, if I were called on a great quest, my own Samwise would be right there beside me, even if it meant going into danger and having to eat lembas bread for days on end. I hope you have someone like that, someone who will walk into the darkness with you and remind you of all the things you hold dear, all the beautiful things worth fighting for. Because the only way evil loses is if you remember what you’re fighting for. The only way evil loses is if you hold onto the people you love. Love and friendship and home—as Samwise reminds Frodo, those are things worth fighting for.